The people in Kansas are choking on the soil they once cultivated with their farm-worn hands. Eleven-year-old Jack Clark’s family –– town –– cannot make it much longer through the Dust Bowl. As Jack’s father said, “The dust can have it.” The crops are dead, friends have moved, Jack is bullied, their daughter is dying of dust pneumonia, and most of all the people’s hope has dried up along with the soil. Call it “dust dementia” or a rain ghost, Jack believes he knows where the rain is hiding. Matt Phelan’s graphic novel combines historical fiction with a tall tale punctuated by gritty clouds of chalk and watercolor. It is a story that is suspenseful, heart wrenching and at times heinous, but it works as a piece of history and as a ghost story. Initially, Phelan planned an illustrated graphic novel, according to an interview at Newsarama, later realizing that the graphic novel was a better choice. “I realized that I could convey the same information with a handful of drawings. Not only could I tell the story with more precision, I could use silence in the pictures. From that point on, I knew it had to be a graphic novel,” said Phelan. 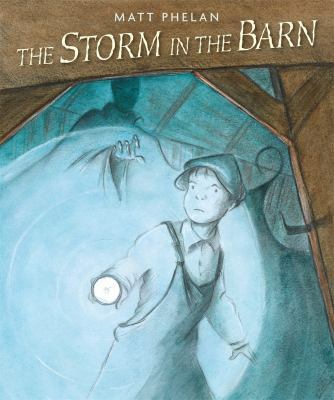 STORM IN THE BARN makes a place for itself among the ranks of good comic storytelling –– at all once describing the tragedy of the Dust Bowl era while spinning a sooty ghost yarn. In an act of frustration and desperation to save what land and green there is left, a group of men round up the swarming rabbits, hundreds or thousands perhaps, and club them to death. It is not a bloody scene but destructive and powerful nonetheless. Ever the fan of dual text approaches, THE STORM IN THE BARN would braid nicely with a book of Dust Bowl photographs. In lieu of a photography book, a slide show of Dust Bowl photographs garnered from the Internet would make for an engaging introduction, supported by a nonfiction book of the time combined with this graphic novel. There are enough community members left who lived during that time, that an interview of a community member would also add depth to the unit. A teacher’s guide is available as a pdf. Click here to see the video trailer of the comic.